Tidewater condo for sale in Orange Beach AL. Nice beachfront property overlooking the Gulf of Mexico and the sugar-white beaches. Condominium features built-in bunk beds, queen sleeper-sofa and has full-size clothes washer & dryer. This resort home was painted in 2017. Nice private balcony! Tidewater amenities include a large outdoor pool, indoor heated pool, hot tub and sauna – the fitness facility overlooks the Gulf! Great real estate investment with benefits! 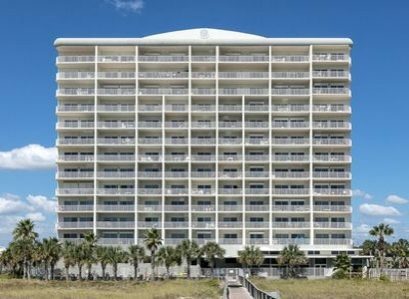 Tidewater condos in Orange Beach is a beachfront community on the Alabama Gulf Coast, each residence in this condominium has unobstructed views of the popular white beaches and emerald waters. The common amenities include indoor/outdoor pools, an exercise facility, sauna and more. This low-density property is convenient to entertainment, dining & activities, and would be ideal as a real estate investment and/or 2nd home. City of Gulf Shores · Gulf Shores Wikipedia.